The Vina (also spelled veena), a stringed instrument of the lute family, is used in Carnatic music. Vina designs have evolved over the centuries; variations include the Rudra vina, Mahanataka vina, Vichitra vina and Gottuvadhyam (Chitra) vina. Currently, the most popular design is known as the Sarasvati vina. This has twenty-four frets; four main strings which pass over the frets and are attached to the pegs of the neck; and three supporting strings, which pass over an arched bridge made of brass and are used as side strings for rhythmic accompaniment. The vina is played by sitting cross-legged and holding the instrument in front of oneself. The small gourd rests on the left thigh, with the left arm passing beneath the neck of the instrument and the left hand curved around so that the fingers can press the strings against the frets. The vina's main body is placed on the floor, partially supported by the right thigh. Sarasvati, the Goddess of learning and the arts, is often depicted with vina in hand, seated upon a swan or peacock. The sitar is probably the best-known Indian instrument in the West. 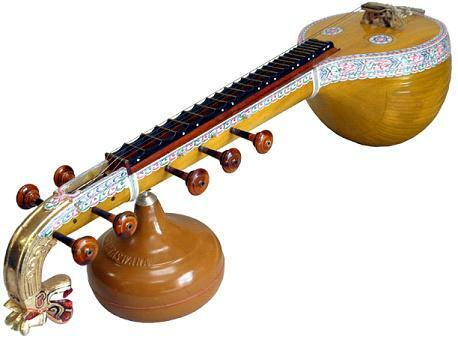 This stringed instrument has been ubiquitous in Hindustani classical music since the Middle Ages. The sitar became popular in the West when Pandit Ravi Shankar introduced Indian music to the masses, aided by popular rock groups such as The Beatles. The sitar is distinguished by its curved frets, which are movable (allowing fine variation in tuning) and raised, so that resonant, or sympathetic, strings can run underneath the frets. In conjunction with the gourd resonating chamber, this produces a lush, distinctive sound. A typical sitar has 18, 19 or 20 strings, depending on the style. 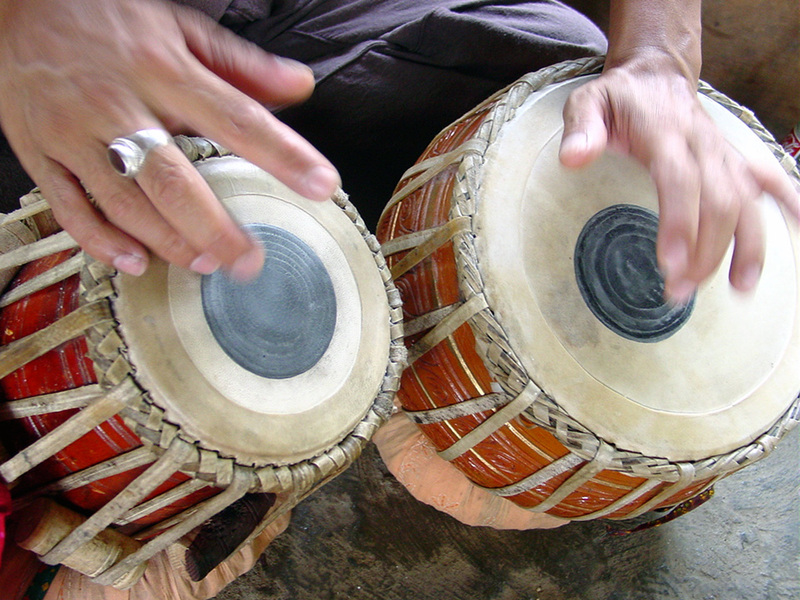 The tabla is a popular Indian percussion instrument used in the classical, popular and religious music of the Indian subcontinent, primarily in Hindustani classical music. It consists of a pair of hand drums of contrasting sizes and timbres. 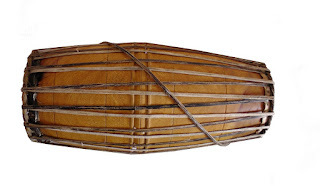 Legend has it that the 13th-century Muslim Persian poet Amir Khusrau invented the tabla by splitting the mridangam into two parts. 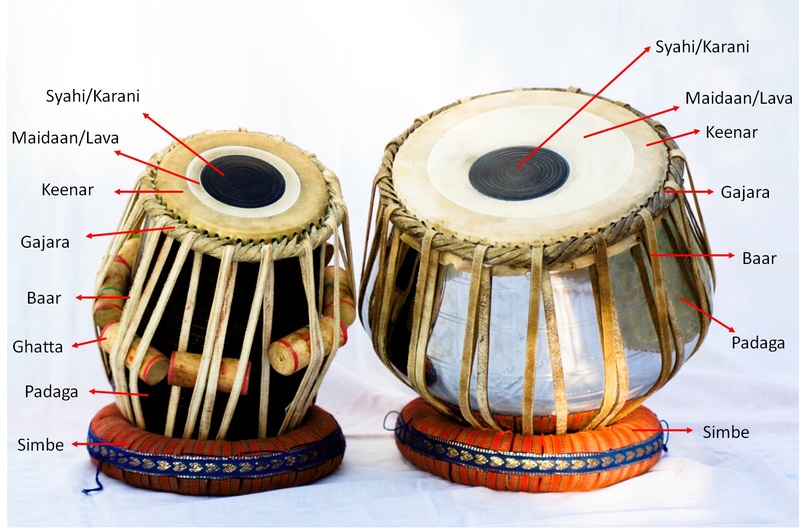 The transformation of the tabla from a religious-folk instrument to a more sophisticated instrument of art-music occurred in the late eighteenth or early nineteenth century, when significant changes took place in the feudal court music of North India. The mridangam is a percussion instrument from South India. 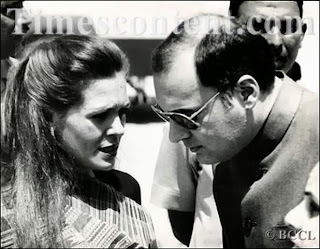 It is the primary rhythmic accompaniment in a Carnatic music ensemble. The word mridangam is derived from the two Sanskrit words mrid ( "clay " or "earth ") and ang, ( "body "). Alternate spellings include mridanga, mrudangam, and mrithangam. The mridangam is a double-sided drum made from a piece of jackfruit wood, hollowed out so that the walls are about an inch thick. The two apertures of the drum are covered with pieces of goatskin leather which are laced to each other with leather straps. In ancient Hindu sculpture, art and story-telling, the mridangam is often depicted as the instrument of choice for a number of Deities, including Lord Ganesha. 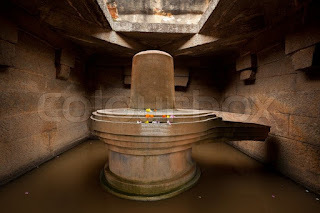 Nandi, Lord Siva's bull mount, plays the mridangam during Lord Siva's tandava dance. The mridangam is thus also known as Deva Vaadyam, the "instrument of the Gods." The shehnai is a tubular instrument of Persia, similar to the nagaswaram but smaller, that gradually widens towards the lower end. It usually has between six and nine holes and employs two sets of double reeds, making it a quadruple reed woodwind. By controlling the breath, various tunes can be played on it. The shehnai was created by improving upon the pungi (or been), the musical instrument played by snake charmers. The tambura (South India) or tanpura (North India) is a long-necked Indian lute, unfretted and round-bodied, with a hollow neck. The wire strings (four, five or, rarely, six) are plucked one after another in a regular pattern to create a drone effect. The larger tanpuras are called "males " and the smaller ones "females". Louder than any other non-brass instrument in the world is the nagaswaram (also called nadaswaram), one of the most popular classical instruments of South India. It is a large wind instrument with a hardwood body and a large flaring bell made of wood or metal. The nagaswaram is considered to be highly auspicious, and it is the key instrument which is played in almost all Hindu marriages and temples in South India. The instrument is usually played in pairs and accompanied by a double-headed drum called tavil. The santoor is a trapezoid-shaped hammered dulcimer often made of walnut, with seventy strings. The lightweight, specially shaped mallets (mezrab), also of walnut, are held between the index and middle fingers. A typical santoor has two sets of bridges, providing a range of three octaves. Like other forms of the hammered dulcimer, the santoor is derived from the Persian santur; similar instruments are found in Iraq, Pakistan, Armenia, Turkey and other parts of Central Asia. The Indian santoor is more rectangular and can have more strings than the original Persian counterpart, which generally has 72 strings. 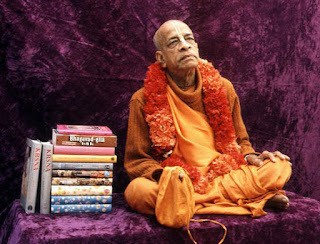 The santoor is placed on the lap with its broad side closest to the body. Using both hands, the musician lightly strikes the strings with the mallets, sometimes in a gliding motion. The palm of one hand can be used to gently muffle strokes made with the other. The resultant melodies resemble the music of the harp, harpsichord or piano. In the Hindustani music tradition, the most important bowed string instrument is the sarangi of North India and Pakistan. Of all Indian instruments, it is said to best approximate the sound of the human voice. Carved from a single block of wood, the sarangi has a box-like shape, usually around two feet long and around half a foot wide. The lower resonance chamber is hollowed out and covered with parchment and a decorated strip of leather at the waist which supports the elephant-shaped bridge--which in turn supports the pressure of approximately 40 strings. The bamboo flute is one of the oldest instruments of Indian classical music. 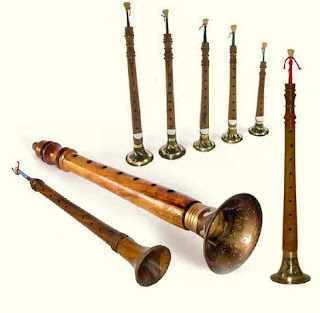 Developed independently of the Western flute, it is simple and keyless; sliding the fingers over the holes allows for the ornamentation so important in raga-based music. There are two main varieties of Indian flutes: the bansuri, with six finger holes and one blowing hole, is used predominantly in Hindustani music; and the venu or pullanguzhal, with eight finger holes, is primarily used in Carnatic music.